Spanning 101 hectares, Gardens by the Bay houses over 250 thousand rare plants in huge domed conservatories. The Gardens comprises three spaces-Bay South, Bay East and Bay Central. Bay Central connects Bay South and Bay East. At Bay East, there are pretty pavilions, lush lawns, tropical palm trees and natural blossoms, ideal for an evening stroll or a picnic with family and friends. Along its two-kilometre waterfront promenade, you can get an amazing view of the skyline. As of now, Bay South is the largest waterfront garden of the three and this is also where you will find the impressive Supertrees and the iconic Gardens' cooled conservatories - Flower Dome and Cloud Forest. If you are short for time and want to check out the highlights for Gardens by the Bay, just go straight to Bay South. Access to the outdoor Gardens is free and the Gardens are open from 5am to 2am daily. Entering the Gardens, you're immediately introduced to one of the main attractions: the Supertrees. Standing between 25 and 50 m tall (80-160 ft), each Supertree is a vertical garden supporting a range of ferns, vines, orchids and other plants, which creep over the towering, purple skeletal structures. Each Supertree is designed to mimic the function of a real tree, with photovoltaic cells to echo photosynthesis and contribute energy to run the park. The trees also collect water during Singapore's frequent heavy rains and channel it throughout the park wherever irrigation or fountains are needed. Some are also used as exhaust flues for the Gardens' underground biomass boilers. This image belongs to the travel and nature stock photo library. This stock photo of Supertree Grove is available for licensing for commercial and editorial uses including websites, blogs, books, magazines, brochures and advertising. Restrictions may apply for images which contain third party copyrighted material or sensitive subjects. Photos of artwork are for editorial use only. 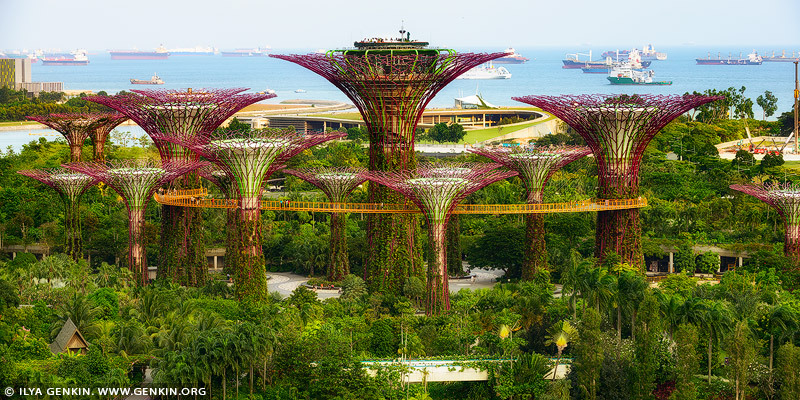 This image id SINGAPORE-0010 of Supertree Grove, is copyrighted © by Ilya Genkin. This is not a public domain image.